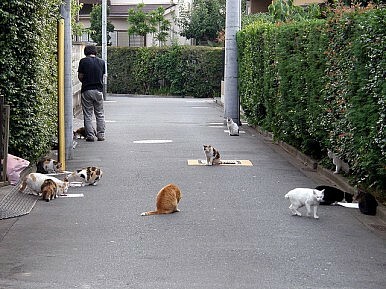 Mamoru Demizu spent $250 a day to provide premium food to 120 cats, mostly strays. An unemployed 48-year-old man from Osaka was arrested in September for stealing cash and valuables worth an estimated 19 million yen ($185,000) from 32 different homes – a rare number of successful heists in a country that boasts the lowest total crime victim rate in the G20. His motive? To be able to afford gourmet cat food for more than 120 cats. “It was the happiest moment when I rubbed my cheek against a cat,” Mamoru Demizu, the cat-loving culprit, told police after his arrest. Demizu pled guilty at his arraignment last week. Demizu began collecting felines in 1993, and then started distributing his leftovers to local strays in 2010. At the time of his arrest, Demizu was keeping 20 cats – spread out between his home in Izumi, Osaka Prefecture, and a nearby rental warehouse. He also embarked on late-night missions to convenience store parking lots and local parks to care for an additional 100 strays. His insistence on providing the cats with premium food is likely what caused Demizu to embrace a life of crime. After losing his job in 2011, he relied on a woman that he was living with to cover the cost, which likely grew to be more than she could handle. Demizu told an arresting officer that it cost a whopping 25,000 yen ($243) a day to feed all 120 of them. Demizu told police that he broke into homes in his neighborhood during the daytime when families were most likely to be at work or school. He said that he entered through unlocked windows or by finding hidden keys outside of the homes. While many of Demizu’s feline friends are probably wondering what happened to their gourmet dinners, the city of Izumi is likely benefiting from a decline in rats and other pesky rodents. Cat lovers may want to skip the following paragraph. It is unclear what will happen to the 20 cats that Demizu kept indoors, but euthanasia seems likely. The Japanese Environment Ministry reported that 131,000 cats were destroyed in the year ending March 2012. More than 80 percent of pets that are discarded by their owners at animal shelters in Japan wind up in the gas chamber – a practice that has largely been banned in the West.